Among ovarian tumors epithelial cell tumor are the most common tumors. Among epithelial tumors serous type is the most common tumor. Less common types are mucinous, clear cell, endometroid, transitional cell (Brenner), and undifferentiated tumors. Mucinous tumors are either benign, borderline, or malignant. Borderline tumor is of low malignant potential. Here we report a case of borderline mucinous cystadenoma in a 28 year old female para3, living3, one ectopic pregnancy, who had pain in abdomen since 5 months. She presented to us in the outpatient department (OPD) and was managed successfully by exploratory laparotomy with left salpino-oophorectomy followed by total abdominal hysterectomy and omentectomy. Ovarian cancer is third most common cancer in women after cervical and breast cancer. Ovarian tumors are classified on the basis of histology. Epithelial ovarian tumor is most common; in 90 % cases. According to histological type; 75-80% of epithelial cancers are serous. Less common types are endometrioid (10%), mucinous (5%), clear cell (5%), transitional cell (Brenner <1%), and undifferentiated carcinoma <1%. Borderline mucinous tumors of low malignant potential are difficult to identify, detailed study of multiple sections are needed. Well differentiated mucinous epithelium may be seen immediately adjacent to a poorly differentiated focus. These cystic ovarian tumors have loculi lined with mucin secreting epithelium. The lining epithelial cells contain intracytoplasmic mucin and resemble those of endocervix and pylorus or intestine. They may reach enormous size, filling the entire abdominal cavity. Management of borderline mucinous tumor is surgical removal. A 28 year old woman, married since 8 years, para 3 living 3, one ectopic pregnancy came to OPD with complaints of pain and abdominal distension since 5 months. There was no history of any other medical or surgical illness. Menstrual cycles were regular. She had all 3 normal deliveries. She had an ultrasonography (USG) report on presentation that showed a right renal calculus, and a left adnexal teratoma extending to right side. Uterus was anteverted normal size, right ovary was normal in size, left ovary was about 18x10x14 cm sized, a heteroechoic soft tissue mass was noted and in the midline there were hypoechoic necrotic areas and areas of calcification. This lesion showed internal vascularity. 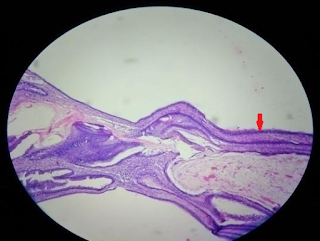 Left ovary was not seen separately . On examination general and systemic examination were normal. Per abdomen examination showed a 28 weeks size mass arising from the pelvis. There was no guarding, rigidity, or tenderness. On per speculum examination cervix was hypertrophied and deviated to the right side. On vaginal examination a mass of 28 weeks, arising from the pelvis was felt. Mass was felt in the left fornix, extending upto the abdomen. Uterus was retroverted, and its size could not be assessed. Ultrasonography was repeated. It was suggestive of a multiloculated cystic mass about 16x13x17 cm in size probably arising from the left ovary, left ovary separately not visualized suggestive of a mucinous cystadenoma. Right ovary and uterus were normal in size and appearance. Ultrasonography of kidney, ureter and bladder was within normal limits. CT scan showed left ovarian mass with multiple cysts, some cysts showing hemorrhage. It measured 21x12x19 cm. Few calcification's were present. It was well defined, smooth mass sited on the uterus. Uterus and right ovary were normal. No lymphadenopathy and ascites were seen. CT scan findings were suggestive of left ovarian cystic neoplasm with hemorrhagic cyst. Tumor marker serum alpha fetoprotein was 1.75 ng/ml, and serum CA125 was 56.2 units/ml. Serological, biochemical and coagulation profile were within normal limits. On staging laparotomy approximately 20x20x6.5 cm solid cystic mass arising from the left ovary was seen. Left ovarian mass was removed and sent for frozen section, which was suggestive of borderline mucinous neoplasm. Exploratory laparotomy with left salpingo-oophorectomy followed by total abdominal hysterectomy with omentectomy was done. Specimen was sent for histopathology. On day 5 patient was discharged. Histopathological impression was of a borderline mucinous neoplasm of the left ovary. Red arrow shows complex papillary and glandular architecture. The lining epithelium shows mucinous epithelium (intestinal type). Figure 2. Histopathology picture of Borderline mucinous cystadenoma. (High power ). 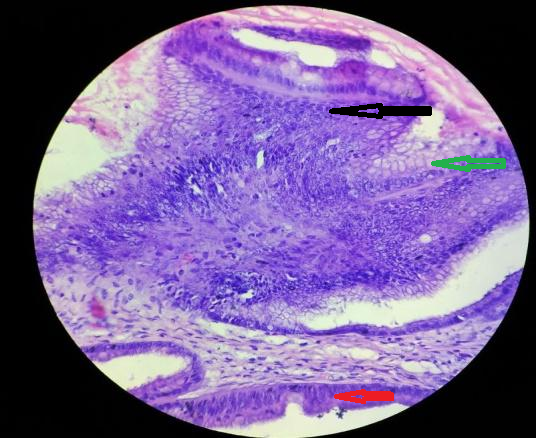 Black arrow shows the cells showed high N: C ratio. Green arrow shows prominent nucleolus with few goblet cells. Red arrow shows complex papillary and glandular architecture. The lining epithelium shows mucinous epithelium (intestinal type). No invasion is seen. Taylor first described as other type tumor that was different from benign as well as malignant epithelial ovarian tumor. WHO assigned name “borderline” in 1973 to those tumors having morphological criteria with absence of stromal invasion. Presently, borderline ovarian tumors are staged according to international federation of gynecology and obstetrics (FIGO) classification of ovarian cancer. Mucinous tumor represent about 8 to 10 % of epithelial tumor. Mucinous tumors are divided into three types; benign, borderline, and malignant. Borderline tumors remain confined to the ovary for long periods, occur predominantly in premenopausal women between 30 to 50 years of age and are associated with very good prognosis. Principle treatment of borderline tumor is surgical resection of the primary tumor. There is no evidence that adjuvant chemotherapy and radiotherapy improve survival. If frozen section determine the histology of borderline and patient is premenopausal and desires to preserve ovarian function in that case conservative surgery like unilateral oophorectomy or cystectomy may be done. As per Ayhan et al., borderline ovarian tumor can safely be treated with conservative surgery. As per Guvenal et al’s study, 3% recurrence rate was seen in patients who underwent radical surgery whereas 8.3% recurrence rate occurred in patients who underwent conservative surgery. As per Boran et al. study no recurrence were reported in patients who underwent radical surgery, whereas the recurrence rate was 6.5 % in patients who underwent conservative surgery. Borderline tumors are considered to be precursors of low-grade ovarian cancers. Accurate diagnosis and staging facilitate optimal patient management. If conservation of fertility is not required then radical surgery is preferable. We thank Dr. Mona Agnihotri, pathologist at KEM hospital for histopathology report and histopathological images. Scully RE, Young RH, Celment PB. Tumours of the ovary, maldeveloped gonads, fallopian tube and braod ligament. In Rosai J, Sobin LH. editors. Atlas of Tumor Pathology, 1st edition. Washington, D.C.: Armed Forces Institute of Pathology 1998;3rd series. fascicle 23: pg 81. Taylor HC Jr. Malignant and semi malignant tumours of the ovary. Surg Gynecol 1929; 48:204–230. Gershenson DM. Clinical management potential tumours of low malignancy. Best Pract Res Clin Obstet Gynaecol. 2002;16(4):513–527. Berek JS, Friedlander ML, Hacker NF. Epithelial ovarian, fallopian tube and peritoneum. In Berek JS,Hacker NF, editors. Berek and Hacker’s Gynaecologic Oncology. 6th edition.Philadelphia: Wolters Kluwer Health – Lippincott Williams & Wilkins 2015; pg. 443-508. Ayhan A, Guvendag GES, Guven S, Kucukali T. Recurrence and prognostic factors in borderline ovarian tumors. Gynecol Oncol. 2005;98(3):439–445. Guvenal T, Dursun P, Hasdemir PS, Hanhan M, Guven S, Yetimalar H, et al. Effect of surgical staging on 539 patients with borderline ovarian tumors: a Turkish Gynecologic Oncology Group study. Gynecol Oncol. 2013;131(3):546–550. Boran N, Cil AP, Tulunay G, Ozturkoglu E, Koc S, Bulbul D, et al. Fertility and recurrence results of conservative surgery for borderline ovarian tumors. Gynecol Oncol. 2005;97(3):845-51.